I was born and raised in St. Paul, Minnesota, where I spent most of my youth exploring the wonders of the Mississippi River bluffs and the myriad of 10,000 lakes. I developed a natural ability to draw at an early age, but never took the ability seriously. I elected to pursue the respected trade as a draftsman following high school, but the artistic bug still nagged me. I enrolled in the Famous Artist's School correspondence course while beginning a career as a draftsman. I was soon drafted into the Army, where my artistic aptitude landed me a position as an illustrator. After my military stint was over, I decided to pursue an art career, and entered the School of the Associated Arts, in St. Paul, Minnesota. After graduating with a degree in commercial art, I headed for the promised land of Silicon Valley, located in the Santa Clara Valley of California. I started my own graphic design business in San Jose, and created advertising art for many of the valley's electronic companies. After 25 years of designing ad material for print, the artistic bug is biting me again. I have come full circle and am now pursuing my real passion, which is painting-specifically, watercolor painting. I chose watercolors because I love the luminous colors one can achieve as well as subtle washes that are hard to create in any other medium. 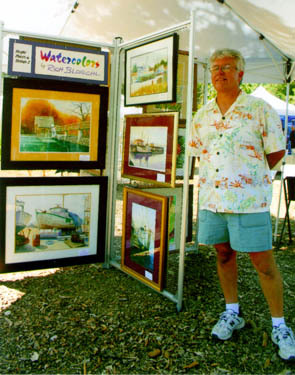 The subjects I paint are gleaned from 30 years worth of photography (another passion), beginning with my roots in Minnesota and continuing with my travels up and down the vast expanse of California. I hope to portray in my paintings, the stimulus to you, the viewer, that caused me to stop and capture the moment in the first place. Watercolor Artist Magazine- Winner, December 2010 monthly painting challenge. "Woodland Winter" selected as "editor's choice" among all entries.